Washington (CNN) – As Ann Romney begins to take center stage at next week's Republican convention, we are learning more about some of the problems she has endured and how she fought back. 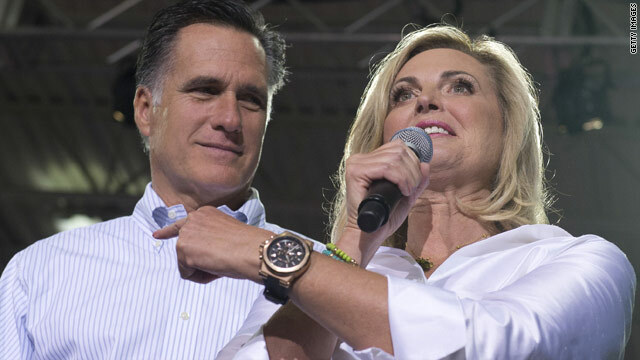 The Romneys, who are protective of the details of their private family life, have spoken often about Ann's battle with multiple sclerosis which was diagnosed in 1998. After the Super Tuesday primaries, she had a recurrence which she kept secret at the time but has since discussed in an interview with CNN. Mrs. Romney also has described to CNN how she successfully fought an early-stage breast cancer diagnosis in 2008. Several months after the couple's youngest son, Craig, was born in 1981, Ann had emergency surgery. After not feeling well, she was rushed to the hospital where doctors found a growth in her abdomen, two sources familiar with the situation told CNN. Around 1991, ten years after Craig's birth, the couple suffered a miscarriage, the sources confirmed. Ann was about four and a half months pregnant when it happened. The sources refused to speak on the record because the Romneys did not want the details made public. The Associated Press first reported on Saturday Mrs. Romney had had a stillbirth, but sources told CNN it was in fact a miscarriage. Those close to the Romneys say Ann's medical problems and how she recovered from them exemplify her strength of will and determination. So WHAT? What does that have to do with anything? While I am happy for Mrs. Romney, but I ask....why would she take the same access to healthcare away from others?
? They have six children , why is this news ? Cry a river – Are we now supposed to "pity the fool??" I usually don't like commenting on potential First Ladies but there are many people out there SICK and many of them don't have insurance. Ann should be lucky she was RICH and had health insurance – yet her husband wants to get rid of Obamacare. ►The sources refused to speak on the record because the Romneys did not want the details made public.◄ But yet their PRIVATE life is out there under the direct OKAY of the Romneys – We're not stupid!! Obama/Biden 2012 – The Only Trusted Way Forward!! I'm happy for Ann, but as someone who works 60+ hours a week and doesn't have health insurance, but I do have MS... I can tell you that even with what I work, I still can't afford more than 2 of my 4 prescribed drugs every month. As people who claim to believe in the sanctity of life, I'm ok with them being against obamacare if they have some better way of ensuring everyone has access to healthcare... but so far I haven't heard it. You people never cease to amaze me. You are ready to release your private health issues but not your taxes?Despicable . She doesnt know what the real world is about.....she says she has raised children and worked?....really?....try doing that like most americans do.....without nannies and house cleaners and working a job. Yep, she has the kind of care that all Mitt's money can buy. How about the poor who are struggling? Mitttt could care less for them, that's based on his incessant desire to repeal teh ACA, which is constitutional. They want sympathy for her medical condition but "you people" won't get any more information on their tax scams. Oh, let her go ride her Olympic wanna-be champion. I don't care about her medical issues – I want to see his tax returns! BTW, when you've got multi-millions tucked away around the globe and can afford people to do EVERYTHING for you, you have a much better chance of getting better/maintaining your health than the average American. Hey Ann.....blah, blah, blah....us little people want to see those pesky little tax records. Many of us have faced or are facing medical issues....so what, that's just life. Good thing she didn't have to use a "Voucher" to pay for health care. Oh bother...can't help myself. So they're wililng to divulge the intimate and private details of Ann's medical history back over 20+ years, but not their finances and tax returns? How about the women who have the same problems, and maybe even worse than you princess anne, and don't have the same medical as you do. Go back to your $77,000 medical write off, as this helped you, but not the middle class or the poor. Looks like the "whiney liberals" are out in force today. Children......Behave! How convenient is that now they are talking about it. Maybe i'm mistaken, but somehow I feel this is an attempt to get sympathy votes. Having a disability myself, I have lupus & pulmonary Hypertension, relating to Ann Romney is quite laughable. Obvious she doesn't worry about her insurance being terminated or not getting the proper care. I don't feel as the Romney/Ryan ticket has our best interest. & Ann Romney doesn't seem as a person who will look & concern herself with "us people". I support & stand behind our current president Barack Hussein Obama because I know he cares! Proudly I say, si se puede! Hispanics 4 Obama..